In 2006 Hydro Mechanical undertook a review our entire Health and Safety Program with the aim to ensure the effectiveness and “health” of our program and policies. Using nationally recognized audit tools, we were successful in achieving our Certificate of Recognition from the Construction Safety Association of BC. 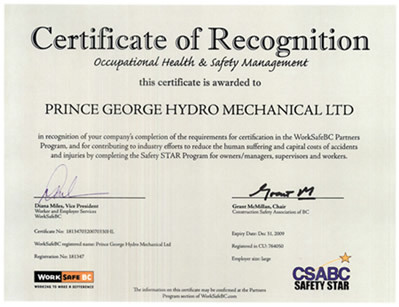 Designed in partnership between CSABC and WorkSafeBC, the Safety Star Program recognizes companies for their contribution to industry efforts to reduce workplace accidents and injuries. We are proud of this achievement and preserve our commitment to safety with Continual Improvement and participation in meaningful industry safety initiatives.